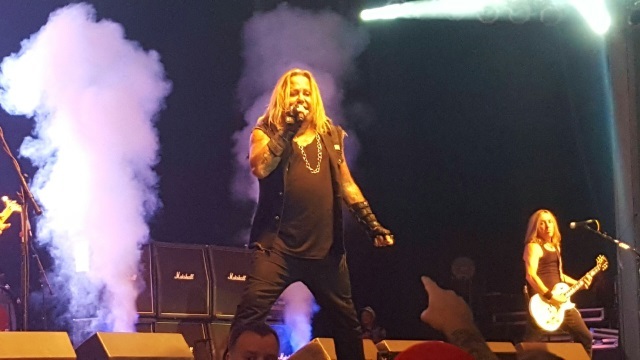 What better way to make up for not seeing Guns N’ Roses at The Gorge than Vince Neil at the Oregon State Fair. Indeed, the original plan for the weekend was to make the trek to The Gorge (about five hours) in Eastern Washington to see GnR but then my plans got upended when The Mrs. decided she wanted her parents in for the long weekend. And adding insult to injury, TicketMaster reduced the price of tickets for the show (I’ve never heard such a thing) making it a bit hard to recover the full money spent. I did manage to sell my ticket but I lost. A lot. Oh, and guess what? The parent in-laws cancelled at the last minute. So that freed up the opportunity to see the frontman for the now retired Motley Crue. 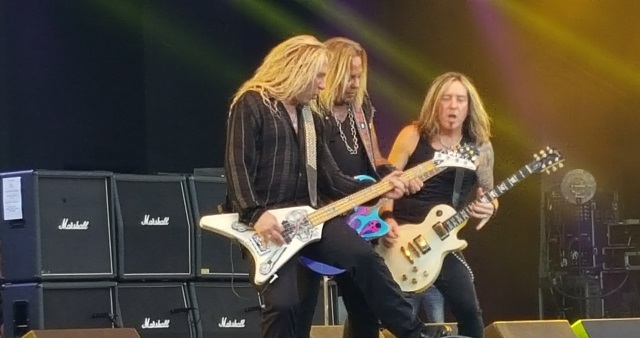 I’ve seen Vince Neil solo before, seven years ago, on his Tattoos & Tequila tour so it should give you a clue as to why I decided to see him again. He was awesome then and he was awesome on Friday in Salem, OR at the L.B. Day Amphitheater on Oregon State fairgrounds. It was all Motley Crue this evening and nothing from any of his three solo albums. Too bad because he’s got some solid efforts that manage to work in a different flavor from his Bad Boy days but how can you complain when you get eight of the classic Crue songs sung by the original singer. Of course, no Nikki Sixx, Mick Mars or Tommy Lee but it’s hardly a cover band. 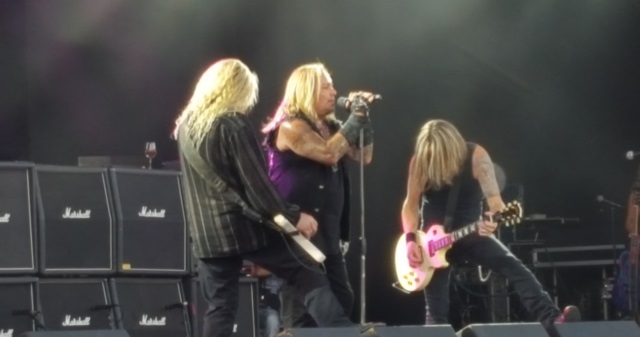 Call it Motley Crue Light because you’ve got veteran musicians and current members of 80s glam rock band Slaughter with bassist Dana Strum, guitarist Jeff Blando, and the craziest drummer you’ll ever see in Zoltan Chaney. It was a blazing fast 45 minutes to open the set. It was that much fun. They sounded just like Motley Crue except in a smaller venue and it was daylight for the first hour. (That’s always a problem for outside summer shows in Oregon especially if you like the typical concert ambiance.) Neil looked like Neil, he’s put on some weight, you know. But unlike some of the shows during Motley Crue’s Farewell Tour he seemed in shape and didn’t forget any lyrics. His voice was sharp and those high vocals. It really is unrealistic hearing those notes coming from him. He did however take an extended break as his bandmates toyed with some Led Zeppelin songs for about 15 minutes. At times it was just noise but fun to watch especially Chaney as they added their own flare to “Whole Lotta Love,” and a song that sounded like Dio’s “Holy Diver” (I have no idea what it was) before finishing their mini set with the “Stairway to Heaven” jam. It did bog the show down a bit and after 10 minutes it was enough already. We’re here to hear Vince Neil. So was it awesome when Neil finally returned with the rocking “Kick Start My Heart.” He closed out the evening with “Girls, Girls, Girls” and “Wild Side.” And that was it. An 11 song set, just eight from Neil, that lasted about an hour and 15 minutes. The crowd expected an encore and were teased for about five minutes as the stage remained dark but the walk-out music started and it was evident they were not coming back. Yes, it was a little disappointing but for a show at a State Fair it mostly ripped. Neil gave it the full treatment and for $35 fans got to see one of the most popular singers from one of the biggest bands to emerge out of the 1980s. It was hardly a sell-out, probably a thousand or so fans, and a far cry from the usual arena tour Neil is used to, but a most enjoyable concert and certainly one worth seeing again. By the way, if you want to witness the closest you’ll ever see an octopus play drums then grab some tickets. Neil scheduled 100 dates this year so he’s bound to get near you. Sit back and watch Chaney play. He’s actually what I remember most from Neil’s last solo show from seven years ago. Economy of motion is not in his repertoire as he uses a lot of needless energy playing but he’s a blast to watch. If he’s not twirling the drum sticks, while playing, he’s tossing them in the air looking more like a magician as he grabs it on cue to hit his punch. He sometimes uses his elbows, his feet too, he’s going behind his head to nail cymbals and he swings his arms around so frantically during songs it looks like he’s got more than two upper body limbs. Unlike Lee who seemed to attack the drums like he was angry with them, Chaney’s throwing a party.